Constant exposure to the sun during summer can lead to your lips darkening. It is important to provide lips with extra care during summer, as lips have comparatively thinner skin than your face. 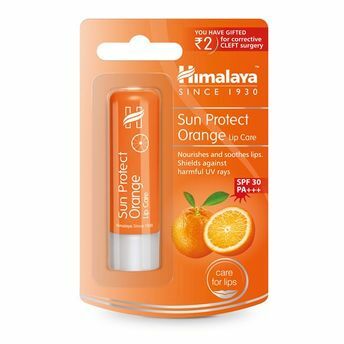 Himalaya Sun Protect Orange Lip Care comes with the power of SPF 30 and PA+++. It is your perfect lip care essential for effective protection against the sun's harmful UV rays. Enriched with Vitamin E, this lip balm has a luxurious moisture-retention formula that also hydrates your lips, making them soft and supple. Stay happy this summer with Himalaya Sun Protect Orange Lip Care! Explore the entire range of Lip Balm available on Nykaa. Shop more Himalaya products here.You can browse through the complete world of Himalaya Lip Balm .